If Disney’s latest film takes off like the Cars series then we are in! “Disney’s Planes” is an action-packed 3D animated comedy adventure featuring Dusty, a plane with dreams of competing as a high-flying air racer. Do you think Dusty will meet the expectations Lightning McQueen has laid out for him? Inspired by “Disney’s Cars”, “Disney’s Planes” has officially revealed the full voice cast for the film which opens in 3D everywhere this summer, August 9th, 2013! 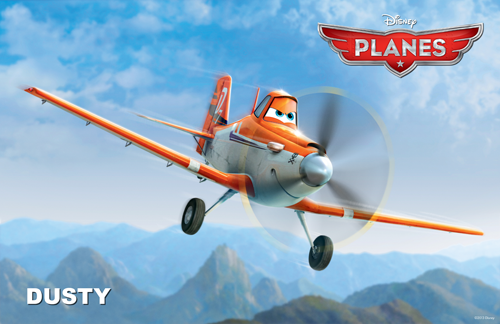 Check out the “Disney’s Planes” Teaser Trailer below. I sure know one thing, it definitely offers up some awesome music! I love some Rob Zombie. Fasten your seatbelts America because “Disney’s Planes” is full of an awesome cast! Joining Dane Cook, who provides the voice of Dusty, are Stacy Keach, Brad Garrett, Teri Hatcher, Cedric the Entertainer, Julia Louis-Dreyfus, John Cleese, Carlos Alazraqui, Priyanka Chopra, Gabriel Iglesias, Roger Craig Smith, Colin Cowherd, Sinbad, Oliver Kalkofe and Brent Musburger. Looks like it will be a fun movie! The kids will certainly enjoy it. I like the cast for the voices! It looks like the filmmakers chose each person with a specific voice that correlates with where they are from, i.e. India (indian actress chosen), Germany (German actor chosen). That shows a lot of promise and dedication on the part of the creators.